In a small apartment in the Gold Coast neighborhood of Chicago, Evan Witmer was buzzing with energy. For months, he had been quietly cloud mining bitcoin in Iceland and reaping the rewards—little to the knowledge of his roommate, Tony Dykstra. For a while now, Witmer has been discreetly celebrating his success in cloud mining by purchasing a bottle of champagne for every $100 he makes, amounting to many, many bottles of champagne. He couldn’t keep his newfound obsession to himself anymore, though. Finally, he decided to invite Dykstra into the cultish, “infectious” world of cryptocurrency and blockchain technology. Nearly a year or so later, Witmer and Dykstra have created a beginner-friendly, Pokémon Go-style app called .HIVE that rewards users for frequenting local haunts with SmartCash—a community-driven, decentralized crypto token. The app will be implemented on the Trinity Christian College campus in Illinois, where both Dykstra and Witmer attended. Users can now sign up to test a closed beta version of the app, which is set to launch in mid-August. (From left) Tony Dystra and Evan Witmer. .HIVE’s chief aspect is its low barriers to entry, meaning that anyone— not just crypto-aficionados —can play the game and earn SmartCash. Witmer and Dykstra view this as a pivotal step in making blockchain and cryptocurrency mainstream by introducing it to young people who can learn about the technology through a game. .HIVE is the latest addition to a growing industry of crypto-centered games, joining the ranks of EtherBots, CryptoCelebrities, CryptoCountries and the ever-popular CryptoKitties. Dykstra describes .HIVE as a “fun, less cute, more functional” game compared to CryptoKitties. 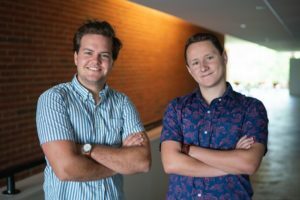 Dykstra and Witmer, at just 22 and 21 years old, respectively, are two in a million of young entrepreneurs entering the startup industry with big dreams for blockchain’s involvement. They attribute the phenomenon to the risk-taking, safety nets and lack of adult responsibilities that 20-somethings can afford to get away with. Their age has not turned off investors and partners for .HIVE. On the contrary, they’ve partnered with Trinity Christian College, located in Palos Heights, Illinois, where both attended school, to test their app among their roughly 1,400 fellow students. (From left) Tony Dykstra and Evan Witmer. The campus will act as what is called a “buzz.spot” on the soon-to-launch closed beta version of the game where users can simply take out the app, register that they are in the buzz.spot and earn SmartCash just for being there. The hope is that students will then use that SmartCash at their campus café, or to exchange it for dollars from a crypto ATM, a project that Witmer is also hacking away at. According to Omar Sweiss, assistant professor of business at Trinity and a mentor to the duo, .HIVE will add to the college experience. “We are a Christian college. Our mission is greater than just education,” says Sweiss. “It’s getting our students ready because the world needs them. Crypto has so much value to underserved communities… We’ve had many situations where students can’t access the funds on their [student] accounts,” and blockchain and cryptocurrency could change that. Trinity has quickly become a breeding ground for cryptocurrency and blockchain entrepreneurs and developers, with Witmer and Dykstra leading the charge. 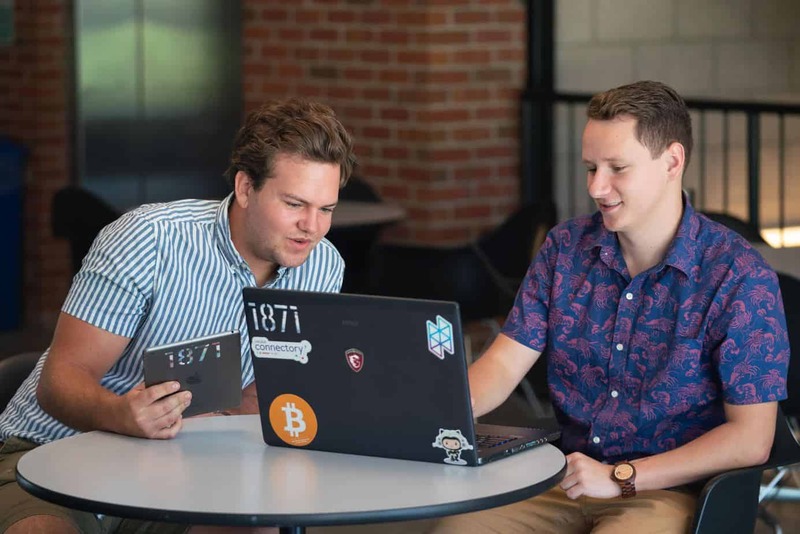 According to Witmer, who also acts as president and founder of the college’s crypto club, over 30 students have signed on to beta test the app already. “First and foremost, we at [Trinity] don’t like to stifle innovation, even if it means some ideas fail,” says Sweiss. With an integrated approach to business and development, Trinity students have the opportunity to pitch business ideas, access Chicago-based tech incubator 1871 and work with real companies in classes. Sweiss even says that he thinks it would be interesting for the college to accept cryptocurrencies for tuition at some point. Dykstra and Witmer aren’t the only Trinity-produced entrepreneurs, either. Ryan Hesslau launched an app called Above the Waves in 2017, which focuses on providing counseling and therapeutic technology to high school and college students. After piloting the system on the Trinity campus, Dykstra and Witmer have big plans for expansion, hoping to sign agreements with brick and mortar businesses wherein they could pay .HIVE to be a buzz.spot, encouraging more patrons to frequent their establishments by offering rewards, such as through .HIVE paying for a coffee or grocery item.